Over 45 high schools across Jamaica have now been outfitted with an automated external defibrillator (AED) unit, courtesy of Team Jamaica Bickle, the organisation which provides support services for Caribbean athletes who compete at the annual Penn Relays in Philadelphia. 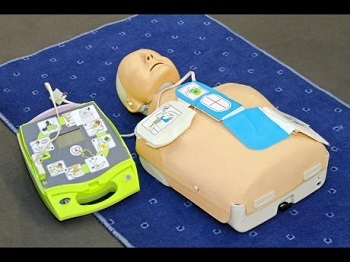 The AED unit is used to treat sudden cardiac arrest. The 'defibrillator to schools programme' was started after the death of St Jago High School athlete Cavahn McKenzie, who died of what was said to be "a massive heart attack" while representing Jamaica at the 2014 North America, Caribbean, and Central American Area Cross-Country Championships in Trinidad and Tobago. Public relations officer for Team Jamaica Bickle, Andrea Daley, who was speaking at a Gleaner Editors' Forum on Friday at the media house's North Street, Kingston, office, said the programme has been doing well and the team is working aggressively to get as many schools as possible involved. "When we heard the news, it hit us that, even though this happened outside of the country, it affected our athletes. We saw that schools didn't necessarily have that resource, and we started the programme then. That year, we had a medical pavilion at the Penn Relays in his (McKenzie) honour and we presented a unit to the principal of St Jago," said Daley. "Since then, we have been donating the unit and also training the staff. We asked schools to send more than one person to be trained, not just for track and field, but anyone from the schools and across the sporting platform can come for training." In 2016, another athlete, Dominic James of St George's College, died after collapsing during a football match. Team Jamaica Bickle said it immediately brought to Jamaica 15 units and held training for schools and staff. Daley said the AED units are issued to schools on a needs basis. "We look for schools that don't necessarily have a strong alumni body that would readily be able to donate to them. We try to look for those schools that would need the external help more than others, but we try to be inclusive as possible with the resources we have," said Daley. Chief executive officer and founder of Team Jamaica Bickle, Irwine Clare, said other schools are seeing the importance of investing in a unit. "The initiative has led other schools that have strong alumni association to go out and buy their own, so it has created awareness," said Clare.